The Nags Head Inn judged the best in Wales by the AA | News by Wales Express News, People Before Profit! The champagne corks were popping as a popular Mid Wales inn was named AA Pub /Inn of the Year for Wales at a prestigious awards ceremony in London last night. Staff with The Nags Head Inn in the background. The Nags Head Inn at Garthmyl, near Montgomery collected the accolade at the AA Hospitality Awards at the Grosvenor House Hotel, Park Lane. The award, the AA’s ultimate accolade for pubs in Wales, is presented to the pub/inn that is recognised as being the most outstanding in this particular market. James and Alison Divall took over The Nags Head Inn two years ago and set about plugging a gap in the market for a pub/restaurant that sold quality, locally sourced, home-made, creative food at sensible prices. 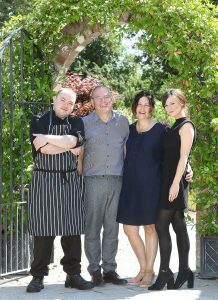 James and Alison Divall with head chef Colin Clark and general manager Abbie Barrett. James has been involved in the hospitality industry all his working life and has worked across England and Wales for many companies in a variety of roles, culminating in a new build manager for Marston’s. After six months of retirement, the opportunity to take over the 19th-century, Grade 2 listed former coaching inn-turned-hotel and restaurant proved too tempting to resist for James and Alison. The tastefully renovated pub, which is ideally located alongside the busy A483 road and the Montgomery Canal towpath, offers creative, fresh food options and locally brewed cask ales together with a wide selection of gins, whiskies and many other drinks. “We are extremely thrilled and excited to win this special award which recognises the high standards achieved consistently by our excellent team,” said James. 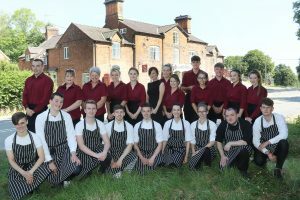 “We all pride ourselves on providing a five-star customer experience and this award will really help put The Nags Head Inn and Mid Wales on the hospitality map. “It’s also recognition for all the hard work and dedication by our excellent team. 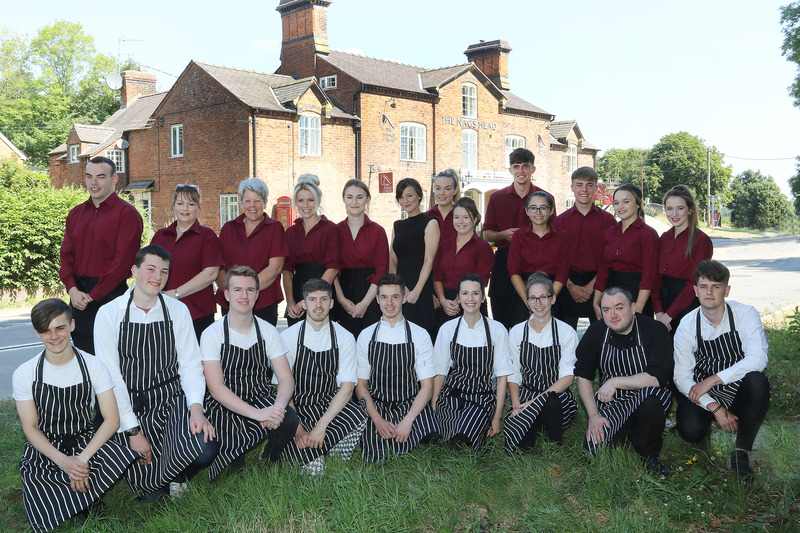 Over the past two years, we have expanded the team from eight to 25 full and part-time staff who all share our passion for quality in everything we do at The Nags Head Inn. Key appointments for James were to promote Abbie Barrett to general manager and bring in head chef Colin Clark, with whom he has worked for many years. The restaurant, which has one AA rosette, offers a choice of lunchtime and evening menus with a good selection of dishes. “We try to cater for everyone, whether it’s a canal cyclist or walker stopping off for a snack, a family celebrating a special occasion or a shooting party requiring private dining,” said James. “We also have five en suite bedrooms, which have achieved five-star gradings from both the AA and Visit Wales and a hotel breakfast award. The bedrooms were designed and fully furnished by designers from renowned Welsh fashion company, Laura Ashley.